Unencapsulated, exfoliated black phosphorus (BP) flakes are found to chemically degrade upon exposure to ambient conditions. Atomic force microscopy, electrostatic force microscopy, transmission electron microscopy, X-ray photoelectron spectroscopy, and Fourier transform infrared spectroscopy are employed to characterize the structure and chemistry of the degradation process, suggesting that O2 saturated H2O irreversibly reacts with BP to form oxidized phosphorus species. This interpretation is further supported by the observation that BP degradation occurs more rapidly on hydrophobic octadecyltrichlorosilane self-assembled monolayers and on H-Si(111) versus hydrophilic SiO2. For unencapsulated BP field-effect transistors, the ambient degradation causes large increases in threshold voltage after 6 h in ambient, followed by a ∼103 decrease in FET current on/off ratio and mobility after 48 h. Atomic layer deposited AlOx overlayers effectively suppress ambient degradation, allowing encapsulated BP FETs to maintain high on/off ratios of ∼103 and mobilities of ∼100 cm2 V–1s–1 for over 2 weeks in ambient conditions. This work shows that the ambient degradation of BP can be managed effectively when the flakes are sufficiently passivated. In turn, our strategy for enhancing BP environmental stability will accelerate efforts to implement BP in electronic and optoelectronic applications. 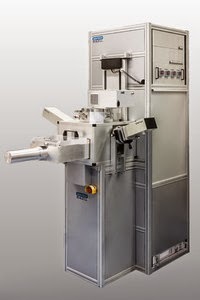 As reported by SoLayTec : Texas-based Mission Solar Energy has ordered an InPassion atomic layer deposition (ALD) machine from Netherlands-based SoLayTec for its high-efficiency n-type silicon bifacial solar cell line. Mission Solar recently opened a solar panel manufacturing facility at Brooks City-Base in San Antonio. The 240,000 square-foot facility produces n-type solar cells and 72-cell 320 W modules for Korea-based OCI Co. Ltd., which is developing four large-scale projects in the region, including the Alamo projects for CPS Energy. SoLayTec says the order is its first U.S. sale. SENTECH Instruments GmbH of Berlin, Germany, which manufactures equipment for plasma etching and deposition, atomic layer deposition (ALD) and thin-film measurements, has presented its new ALD Real Time Monitor in Asia at the 3rd China ALD Conference in Shanghai (16-17 October). For the first time the patented monitor allows the direct monitoring of absorption and desorption processes on the substrate surface during ALD processes within ALD half cycles. “Using the ALD Real Time Monitor enables efficient and fast process optimization,” says Dr Gargouri, SENTECH’s specialist for ALD processes, who gave a speech during the conference. A single nanopore structure that embeds all components of an electrochemical storage device could bring about the ultimate miniaturization in energy storage. Self-alignment of electrodes within each nanopore may enable closer and more controlled spacing between electrodes than in state-of-art batteries. 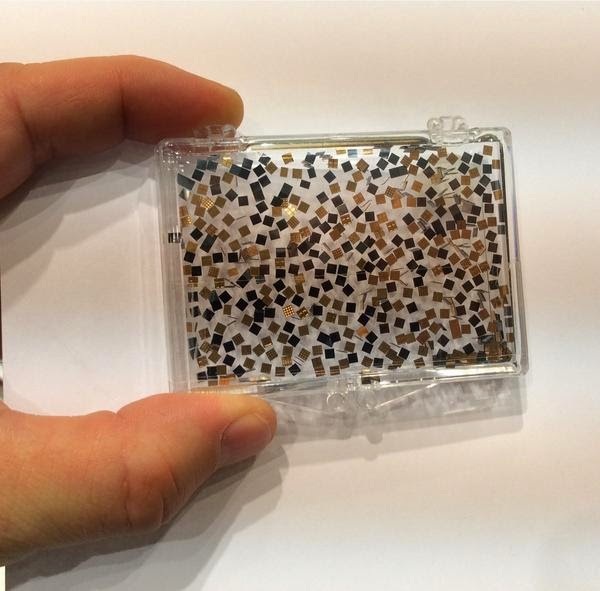 Such an ‘all-in-one’ nanopore battery array would also present an alternative to interdigitated electrode structures that employ complex three-dimensional geometries with greater spatial heterogeneity. 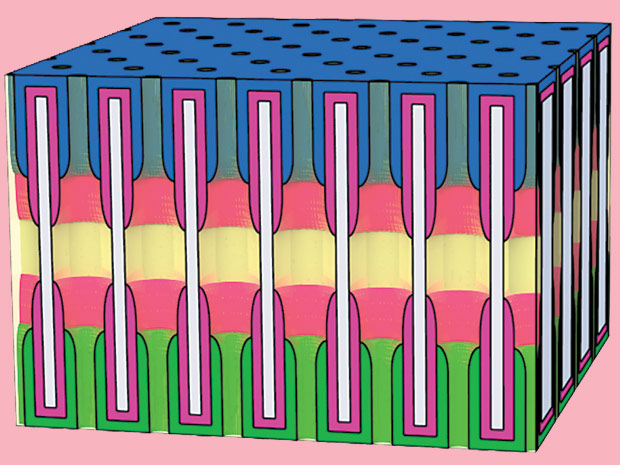 Here, we report a battery composed of an array of nanobatteries connected in parallel, each composed of an anode, a cathode and a liquid electrolyte confined within the nanopores of anodic aluminium oxide, as an all-in-one nanosize device. 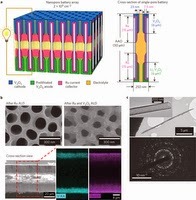 Each nanoelectrode includes an outer Ru nanotube current collector and an inner nanotube of V2O5 storage material, forming a symmetric full nanopore storage cell with anode and cathode separated by an electrolyte region. The V2O5 is prelithiated at one end to serve as the anode, with pristine V2O5 at the other end serving as the cathode, forming a battery that is asymmetrically cycled between 0.2 V and 1.8 V. The capacity retention of this full cell (relative to 1 C values) is 95% at 5 C and 46% at 150 C, with a 1,000-cycle life. From a fundamental point of view, our all-in-one nanopore battery array unveils an electrochemical regime in which ion insertion and surface charge mechanisms for energy storage become indistinguishable, and offers a testbed for studying ion transport limits in dense nanostructured electrode arrays. Engineers at the University of Maryland have invented a single tiny structure that includes all the components of a battery that they say could bring about the ultimate miniaturization of energy storage. Fraunhofer IPMS-CNT and IZM-ASSID presented ultra-thin and integrated capacitors with a high capacity and specially tailored features for industrial applications at electronica, the international trade show for components, systems and applications in the electronic sector in Munich (November 11-14, 2014). 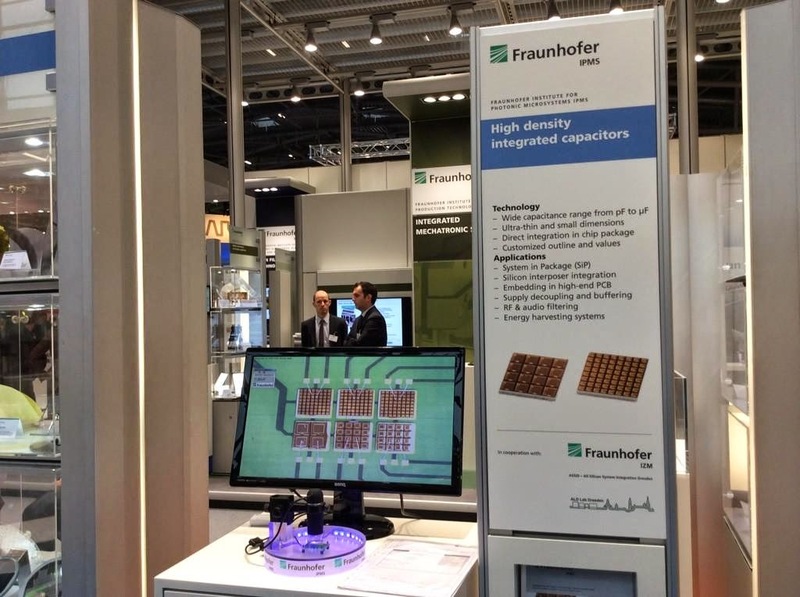 The division "Center Nanoelectronic Technologies" (CNT) is the Fraunhofer IPMS research and development platform for material and process optimization for the industrial semiconductor production. Together with Fraunhofer IZM-ASSID and ALD Lab Dresden, a competence center for atomic layer deposition, the CNT developed an ultra-compact capacitor for direct integrated circuit packaging. The capacitor’s design and features can be adapted to specific customer requirements and a large range of capacity values can be achieved with the use of high-k materials and special structuring processes. Customizable high density integrated capacitors. Besides the direct integration (“system in package”), the capacitor is also suited for implementation in high-end printed circuit boards. In addition, the technology is also used in interposers or directly on the chip metallization level. The application fields of these capacitors vary and may include signal filtering in low- and high-frequency applications, for decoupling purposes and as energy storage. As reported by Nanotechweb.org: Researchers at Arizona State University in the US say that they have made a new molecular reader that might be able to sequence DNA. The device works by capturing molecules in a hole cut into a layered tunnel junction. The work is part of a global effort to develop speedy, low-cost methods to read DNA nucleotides – the building blocks of life. The fixed-gap layered tunnel junction developed by the ASU team is different in that the tunnel gap is defined by a dielectric, which the researchers grow on the device using a routine and well-known technique called atomic layer deposition (ALD). They then drill a hole through the layers using a process called reactive ion etching so that the tunnel junction can be exposed to molecules in solution. When the metal electrodes making up the junction are functionalized with so-called recognition molecules that capture DNA nucleotides (thanks to hydrogen bonding), the team is able to identify individual nucleotides by measuring how the tunnel current fluctuates. Previous measurements of the electronic conductance of DNA nucleotides or amino acids have used tunnel junctions in which the gap is mechanically adjusted, such as scanning tunneling microscopes or mechanically controllable break junctions. Fixed-junction devices have, at best, detected the passage of whole DNA molecules without yielding chemical information. Here, we report on a layered tunnel junction in which the tunnel gap is defined by a dielectric layer, deposited by atomic layer deposition. Reactive ion etching is used to drill a hole through the layers so that the tunnel junction can be exposed to molecules in solution. When the metal electrodes are functionalized with recognition molecules that capture DNA nucleotides via hydrogen bonds, the identities of the individual nucleotides are revealed by characteristic features of the fluctuating tunnel current associated with single-molecule binding events. From AZ Materials: Over the past few years, the wafer-based semiconductor industry has been using the atomic layer deposition (ALD) thin film coating technique to develop a wide range of electronic products and components. For an improved level of system miniaturization and integration, thin films have to be uniform, dense and conformal, as well as free from pinholes, cracks and other defects. When the preferred film thickness begins to approach nanometer scale, traditional thin film deposition methods such as PVD and CVD do not meet this requirement. In contrast, ALD forms excellent quality films even on the most complex nanoscale geometries. This can be attributed to its surface controlled and self-saturating film growth mechanism. LED manufacturing is a wafer-based technology – similar to integrated circuit (IC) device manufacturing techniques. 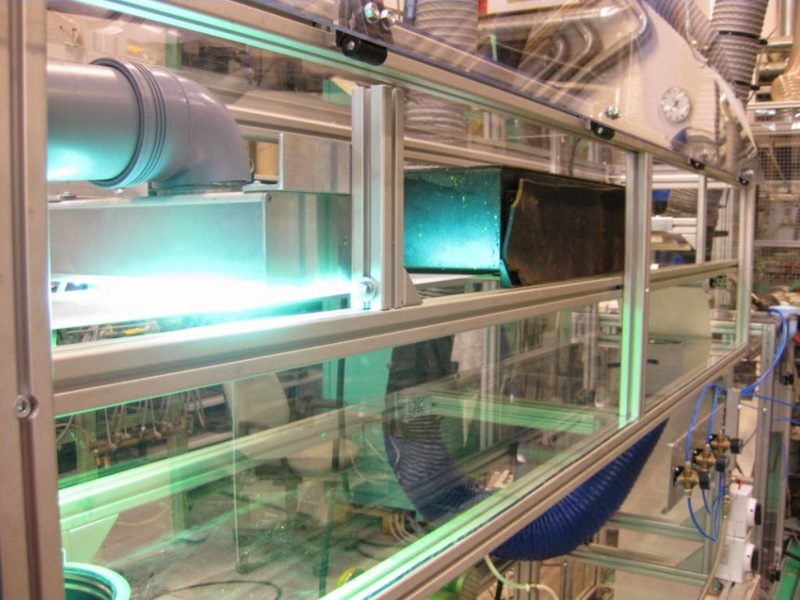 ALD is an optimal method that can be incorporated into current LED manufacturing processes and it can provide a wide range of benefits to the industry, either by introducing new manufacturing steps or replacing existing ones to extend the product lifetime, improve the device efficiency, or to save manufacturing costs. 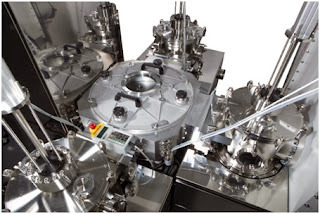 Picosun’s PICOPLATFORM™ 200 vacuum cluster system for wafers up to 200mm diameter. Suomessa kehitetty atomikerroskasvatus eli ALD viettää juhlavuottaan. Menetelmän keksinyt tekniikan tohtori Tuomo Suntola lunasti ensimmäisen ALD-patenttinsa tasan neljäkymmentä vuotta sitten. 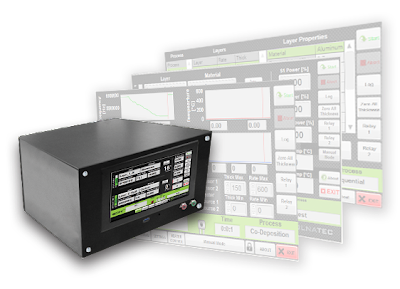 Colnatec is expanding its portfolio of high-precision, thin film measurement and control devices, Colnatec today announced the debut of a compact controller that unites the leading-edge technology of its Eon™ series of PC-based controllers with the modular efficiency of rackmount instrumentation. With its integrated display, intuitive user interface, and durable architecture, Eon-ID™ offers a versatile design that adapts easily to a variety of settings - ranging from industrial to laboratory to clean room to research environments - matching or surpassing the capabilities of Inficon™ XTC/3™ and IC6™. Among its numerous features, Eon-ID™ offers the latest Eon Software™ interface, an integrated display allowing for a greater variety of settings and applications, rackmount capability, a temperature compensation system that maintains crystal to within +/- 1°C of preset temperatures, advanced technology that increases reliability and durability in industrial environments. "Eon-ID™ employs the same temperature-centric technology used in our Eon™ and Eon-LT™ series controllers," noted Colnatec CEO Wendy Jameson. "Eon-ID™ will specifically benefit industries using atomic layer deposition (ALD), optics, OLED, and any other process that requires precision control over very thin layers, especially at temperatures higher than 100°C. Combining precision, simplicity, and cost effectiveness, Eon-ID™ represents nothing less than the state-of-the-art in thin film science." Taking a revolutionary approach to thin film design, development, and manufacturing, Colnatec (colnatec.com) manufactures the only commercially available heated quartz crystal microbalances (QCM) for process control of film thickness measurement in high temperature processes such as atomic layer deposition (ALD) or chemical vapor deposition (CVD). Through the use of patented and patent-pending Colnatec technology, researchers, manufacturers, and system-builders have reduced production and run times and costs to improve overall performance - ultimately achieving higher yields and improved process control. Colnatec technology is also frequently used in, encapsulation and high flux deposition of organic light emitting diodes (OLED), optical coatings such as for anti-reflection (PVD), next generation food packaging, and medical device coating, etc. Launched in 2009, Colnatec is the recipient of Department of Energy Phase I and Phase II SBIR awards for high temperature sensors, and one of eight winners of the inaugural Arizona Commerce Authority Innovation Challenge Grant. Colnatec has built a reputation as a bold innovator and a formidable player in a tough, highly competitive marketplace. As reported by VTT: Juha Nikkola M.Sc.(Tech. 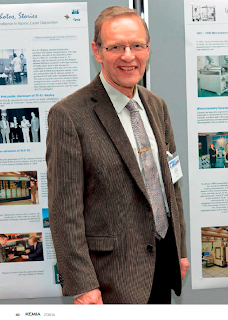 ), Senior Scientist at VTT Technical Research Centre of Finland, developed new hybrid materials in his doctoral research project for use in the manufacture and modification of thin-film composites. The project resulted in new materials suitable for instance for food packaging with enhanced diffusion barrier and for membrane filters with improved anti-fouling properties used in water purification. In the future, similar materials may find use in flexible OLED displays and in wall and ceiling panels. The doctoral research project involved developing surface materials that decrease bacterial adhesion to the surface. Improved surface materials can help keep membrane filters or wall surfaces clean or improve the preservation of food. Food spoilage can be delayed with a new type of cardboard package coated with a plastic incorporating the thin-film composite structure developed in the present project. Such diffusion barrier materials may also find use in flexible OLED displays in the electronics industry or in replacing thickly layered paint on wall and ceiling panels. The doctoral research project involved studying and developing flexible thin-film composites using various coating techniques and studying the impact of the surface layer on the permeability and anti-fouling properties of the thin-film composite. The hybrid materials developed can be produced in roll-to-roll processing. 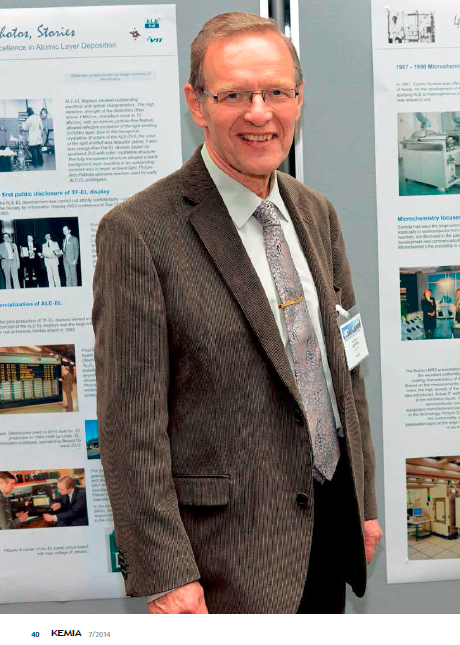 The research focused on atmospheric plasma deposition, atomic layer deposition (ALD) and sol-gel deposition techniques. Thin-film composites can be manufactured using a roll-to-roll process. The photo shows the VTT coating production line. A hybrid material is simply a combination of two materials at the macro, micro or nano level. Hybrid material is typically a blend, multilayer or nanostructured material. For instance, multilayer structures manufactured using thin-film deposition techniques can be named as hybrid materials. Thin-film composites usually consist of three layers with different functions. The support and core layers provide the mechanical properties such as strength and flexibility. The core layer may also have properties affecting the chemical durability, permeability or composition of the composite. The properties required of the skin layer may have to do with separation efficiency, diffusion barrier performance, roughness, surface energy or liquid or gas permeability. Juha Nikkola will defend his doctoral dissertation at the Tampere University of Technology on 31 October 2014 at 12.00. As reported by Nanotechweb : Researchers at the University of Toronto in Canada say that they have made the first perovskite-based spherical resonator laser by coating organometallic halide perovskites uniformly onto glass microspheres. The device might be employed in novel optical communications applications, and the new structure also shows promise for solar cells and photodetectors. Obviously it has been done by ALD! The Toronto team, led by Edward Sargent, employed an industry-standard technique, known as atomic layer deposition (ALD), to grow high-quality one-atom seed layers of lead sulphide and then developed a way to “exchange” these PbS layers with perovskite by exposing them to iodine gas vapour and methylammonium iodide. The resulting structure – a highly pure, polycrystalline film of CH3NH3PbI3 perovskite – can then be coated onto a spherical optical cavity made from a glass microsphere (see figure). This optical cavity lases when pumped with green, red or blue light. Check out the full story here and the paper below. As reported by Laboratory Equipment: A group of North Carolina State Univ. 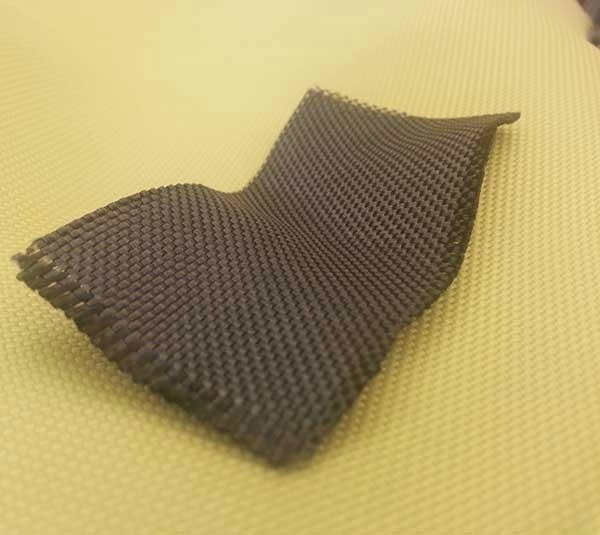 researchers is exploring novel ways to apply semiconductor industry processes to unique substrates, such as textiles and fabrics, to "weave together" multifunctional materials with distinct capabilities. During the AVS 61st International Symposium & Exhibition, being held November 9-14, 2014, in Baltimore, Maryland, the researchers will describe how they were able to weave high-strength, highly conductive yarns made of tungsten metal on Kevlar — body armor material — by using atomic layer deposition (ALD), a process commonly used for producing memory and logic devices. Diffusion barrier stacks for the encapsulation of organic electronics made from inorganic nanolaminates of Al 2O3 and TiO2 with aluminum alkoxide interlayers have been deposited byatomic layer deposition (ALD) and molecular layer deposition (MLD). As a part of the MLD process development, the deposition of aluminum alkoxide with low a density of about 1.7 g/cm3was verified. The ALD/MLD diffusion barrier stack is meant to be deposited either on a polymer film, creating a flexible barrier substrate, or on top of a device on glass, creating a thin-filmencapsulation. In order to measure the water vapor transmission rate (WVTR) through the barrier, the device is replaced by a calcium layer acting as a water sensor in an electricalcalcium test. For the barrier stack applied as thin-film encapsulation on glass substrates, high resolution scanning electron microscopy investigations indicate that the inorganic nanolaminates without MLD interlayers are brittle as they crack easily upon the stress induced by the corroding calcium below. The introduction of up to three MLD interlayers of 12 nm each into the 48 nm barrier film laminate successfully mitigates stress issues and prevents the barrier from cracking. Using the three MLD interlayer configurations on glass, WVTRs of as low as 10−5g/m2/d are measured at 38 °C and 32% relative humidity. On polymer barrier substrates, thecalcium is evaporated onto the barrier stack and encapsulated with a cavity glass. In this configuration, the corroding calcium has space for expansion and gas release without affecting the underlying barrier film. In consequence, a WVTR of about 3 × 10−3 g/m2/d is measured for all samples independently of the number of MLD interlayers. In conclusion, a stabilization and preservation of the ALD barrier film against mechanical stress is achieved by the introduction of MLD interlayers into the inorganic nanolaminate. Top view of glass Ca tests coated with ALD/MLD barrier stacks consisting of a 48 nm Al-O/Ti-O nanolaminate with zero to three aluminum alkoxide interlayers of 12 nm thickness. The layers were deposited at 90 °C on Ca tests on glass and aged at 38 °C and 32% r.h.—picture taken with high resolution scanning electron microscopy after aging. l-Alanine polypeptide thin films were synthesized via atomic layer deposition (ALD). Instead of using an amino acid monomer as the precursor, an l-alanine amino acid derivatized with a protecting group was used to prevent self-polymerization, increase the vapor pressure, and allow linear cycle-by-cycle growth emblematic of ALD. The successful deposition of a conformal polypeptide film has been confirmed by FTIR, TEM, and Mass Spectrometry, and the ALD process has been extended to polyvaline.